The flu season has hit the country, but don’t fret because there are substantial natural flu remedies that’ll help you avoid getting sick, plus help you feel better faster if you should get sick. 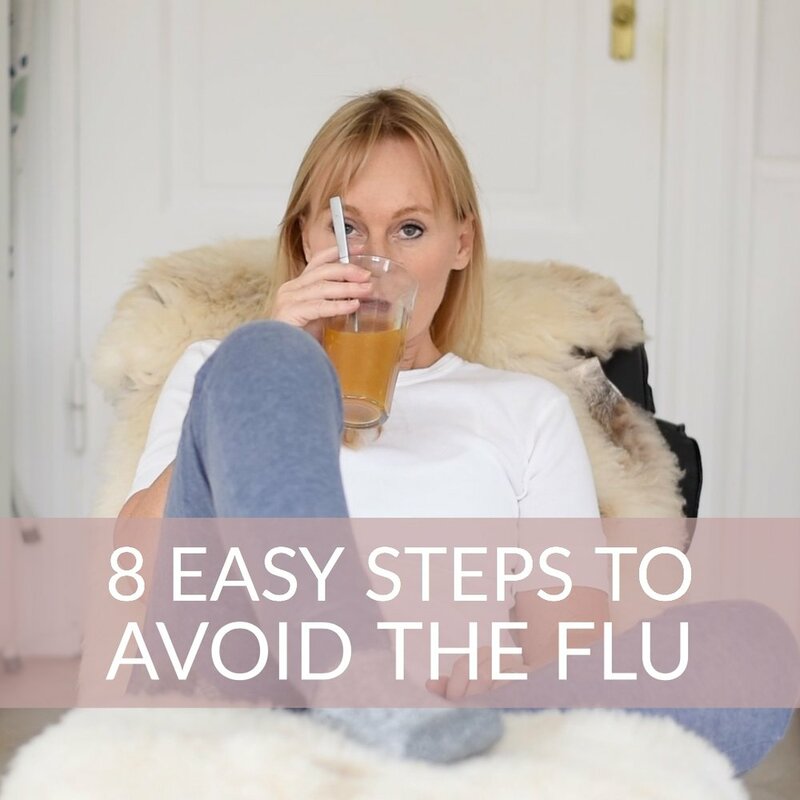 If you’re looking for safe, all-natural (and fast) cold or flu prevention or relief for you and your family, then read on and get my 8 top home flu remedies. It's important to remember that influenza, commonly known as the flu is viral—meaning antibiotics aren't effective at fighting it. There are three types of flu viruses: A, B, and C, and subtypes within these. Type A is the most frequent and serious influenza virus with severe symptoms. Type B has the same symptoms, but not so powerful. Type C symptoms are much less severe and is more like a common cold. There can be multiple sub-types of the flu circulating at the same time, and the virus can change over time, either slowly (which is called antigenic drift) or rapidly (called an antigenic shift), this is why it can be hard to formulate a perfect flu vaccine year after year—and why protecting yourself in other ways is vital. There are a lot of ways you can reduce your risk of getting sick from the flu. Most of them have everything to do with boosting your body’s defense system, improve your digestion and reduce stress. It’s easy, inexpensive and bloody healthy. I’m talking about the healing stuff that’s hiding in bones and marrow. The simmering of bones and ligaments causes the release of compounds like collagen, proline, glycine, and glutamine that actually have the power to transform your health, and is the No. 1 thing you can consume to boost your immune system, and alleviate common cold, flu and bronchitis. It also treats leaky gut syndrome, and help you overcome food intolerances and allergies. It’s definitely what I prescribe to myself and my family to prevent illnesses or when feeling under the weather. By regularly drinking bone broth or using it in recipes, you can help promote strong gut integrity while reducing inflammation. These gut-supportive benefits, have a holistic effect on your body and support healthy immune function. My favorite healing/beauty herbs are Calendula + Goldenrod. These herbs are amazing on their own, and magnificent together. You can use them as hot compression around your neck or drink as tea. CALENDULA (or Marigold) is not only easy on the eye, but it’s also a powerful antioxidant and is among the strongest of antimicrobial and antiviral herbs. And calendula has been found to have strong anti-inflammatory properties via powerful flavonoids. These plant-based antioxidants protect cells from free radical damage and pro-inflammatory compounds. GOLDENROD (or Solidago) is an astringent herb and a strong decongestant; It contains a flavonoid called quercetin, which acts as an antihistamine, anti-inflammatory, and antioxidant. It’s also rich in the antioxidant compound rutin, whose benefits include strengthening blood vessels and promoting healthy circulation. Goldenrod also supports the overall health of the kidneys and urinary tract by helping to remove harmful organisms (on a side note - in Traditional Chinese Medicine, the health of the kidneys is foundational to overall vigor and vitality). As a mild diaphoretic, Goldenrod helps open up the pores and release heat through the skin. Its anti-inflammatory and anti-microbial properties make this herb extremely soothing. Make a tea from the herbs and drik 1-2 cups a day in times of need, or use the tea as compression or steam inhalation. This will not only help alleviate sore glands, muscles, joints, and throat but also give the virus and microbial a tough time. Dip a folded piece of cotton cloth or flannel into the tea. Place the cloth around your neck until it has cooled to body temperature then repeat. Do it for 10-20 minutes. Repeat the treatment as often as you like – the more, the better. Note: Make sure the cloth is not too hot before you place it on your skin. This type of application act as kind of a facial sauna that can help relieve blocked sinuses, but also infuse the healing herb to your body. Five drops of peppermint, tea tree oil or rosemary essential oils enhance this treatment. Place herbs (and if using essential oils) in the bowl. Finish by dapping your face with a clean towel. Neti is a technique that was used by yogis to stay disease-free. And ancient Danish fishermen also used the method (approached in a slightly rougher manner) by sniffing saltwater from the hand and spitting it out through the mouth claiming that's how they avoided colds. Nasal passages are the first line of defense against bacteria, pollution, allergens, and other irritants; it’s important to keep them clean and functioning. A nasal wash, also known as a rinse or irrigation cleans and moistens the mucous membranes, flush out excess mucous, toxins, dust, pollen and other allergens and germs from nose and sinuses. Clearing the passageways for unrestricted breathing and stimulating the immune function. A neti pot is also a helpful tool for deeper breathing in asana and pranayama. Mystically speaking, a neti pot opens the channels of the third eye, promoting deeper meditation. ½ to 1 teaspoon of salt (I use Himalaya salt) to 16 ounces (two cups) of water. You can add 1/2 teaspoon of baking soda to buffer the solution - that’ll make it a little gentler on your nose. Boil the water and dissolve salt (and baking soda if using) in it. Cool the water solution to body temperature. Lean over a sink and tilt your head at about a 45-degree angle. Insert the spout into your right nostril and begin to breathe through your mouth as you tip the pot up slightly. The saline solution will flow through the right nasal passage and out the left nostril into the sink. If solution runs down into your throat, just spit it out, and blow your nose to get rid of any mucus and excess solution. Repeat the same process in the left nostril. Use daily while suffering from symptoms. Do one pot per nostril. Sticking a finger in your nose can actually make you sick. Your hands, fingers and especially the undersides of fingernails are hotbeds for bacteria. Germs that cause colds and flu need to make their way into your body to infect you, and your nostrils are among the few doorways that allow those microorganisms access to your insides. If you’ve been out and about all day—riding the subway, shopping, grabbing door handles—and you decide to jam your bacteria-coated finger in your nose, you might as well give your finger a lick while you’re at it. Hence hand washing is your first defense against any infections. Use warm water and soap and wash your hands thoroughly. If you don’t have access to soap and water, hand sanitizer is your next best bet. A good strategy is to wash your hands before meals and after commuting or being in other public spaces, like the gym, grocery store, or library. Cleaning your cellphone regularly is also a smart move. I recommend that everyone keep these essential oils in their medicine cabinet at home. Like most herbs, they work well on their own, but using them together creates a greater synergy. PEPPERMINT has significant antimicrobial and antiviral activities, one of the best essential oils for pain-killing and headaches. Peppermint can help open your airways, clear mucus and reduce congestion, and is one of the best essential oils for colds, the flu, cough, sinusitis, asthma, bronchitis, and other respiratory conditions. TEA TREE OIL is one of the top antibacterial essential oils, and it’s been documented in numerous medical studies for its ability to kill many strains of bacteria, viruses, and fungi. And it’s a excellent cough reliever. Mix peppermint oil it with coconut oil and tea tree oil to make a Homemade Vapor Rub. This oil mix penetrates deep into the muscles, it’s soothing and it’ll help fight viruses and infections in your body. Pour the all the oils into a your jar. Keep it fresh in the fridge. USE: You can rub it on your neck, chest or cold sores. You can use peppermint oil as a natural headache remedy, by applying 2–3 drops to your temples, forehead, and back of the neck. Peppermint and tea tree oils are powerful anti-microbial and when introduced into the air in vapor form, the organic compounds within the oils come into direct contact with airborne pathogens before they can invade your body. These essential oils can also be used to boost the immune system. A diffuser can also double as humidifiers which help keep your airways moist and healthy. You can read all about how aromatherapy can clean air and how it affects your body in my post about Smudging. I bought my diffuser on Amazon. A hot compress is a very useful way of using essential oils to relieve, soothe and heal. Dip the cloth or flannel into the water, squeeze out the excess water. Then place the cloth around your neck until it has cooled to body temperature then repeat. Do it for 10-20 minutes. Repeat as often as you like – the more, the better. The oils are generally considered safe when used aromatically and topically and don’t cause side effects in most cases. However, if you have sensitive skin, it’s possible that you might experience a reaction. Keep the oils away from your eyes, contact lenses, inner nose and delicate parts of your skin. I don’t recommend using the oil on the face or chest of infants or young children because it can cause skin irritations. The odors have a menthol-like cooling sensation, which can make your skin feel like it’s slightly burning if you apply too much. Always dilute it with a carrier oil (like coconut oil) first. Peppermint oil is likely safe when taken by mouth although taking excessive amounts can be toxic, so remember that a little bit goes a long way and all you need is 1–2 drops at a time. For some people, ingesting peppermint oil may cause side effects for some that include heartburn, flushing, mouth sores, and headache. You shouldn't consume tea tree oil, and if you are using it for oral health, you have to spit it out so that none is swallowed. When you are buying essential oils, always look for 100 percent pure essential oil and check that the correct it's the proper species name on the bottle’s label. The three amigos. Turmeric, ginger, and garlic. Use these super foods in your cooking as often as possible and it will benefit your body, skin and brain. Turmeric contains bioactive compounds with powerful medicinal properties, and many high-quality studies show that it has significant benefits for your body and brain. And as a natural antibiotic agent, turmeric can inhibit the growth of bacteria, yeast, and viruses. SPRINKLE BLACK PEPPER: One of the primary active ingredients in turmeric is curcumin, which contains anti-inflammatory and antioxidant properties. However, curcumin is not easily absorbed by the body, but a chemical known as piperine in black pepper can increase the amount of curcumin your body can absorb, so have a little pepper with it. ADD SOME FAT: Turmeric is fat-soluble and thus much better absorbed when taken with fat, such as coconut or almond milk. HEAT IT UP: Heat is said to increase the solubility of curcumin by 12 times, which may also increase its bioavailability in the body. Both garlic and ginger can offer potent cold and flu relief. Garlic helps bolster your immune system to squelch an infection, while ginger helps tame nausea. Add a little ginger and garlic to your chicken soup to boost its cold- and flu-fighting power. Eat Raw garlic. Chop a clove, leave it for 10 minutes, then swallow it with water or a mix of lemon juice and water. Drink Ginger tea. Drink daily a cup of ginger tea of freshly chopped ginger, a bit of lemon juice, boiling water and a teaspoon of honey. Golden Milk Turmeric. As mentioned above is a good way for the body to obtain the healing curcumin of turmeric when you mix it with a bit of oil and pepper. Golden milk is a very tasty and very healing drink. For a quick turmeric fix. Mix 2 tbsp of extra virgin olive oil with a pinch of pepper and 1 tsp of turmeric powder. Drink as a shot. It might be too little, too late to start working on your internal vitamin-D storage because that project delivers the most effective results when it's build up in the summertime where it's obtainable to get in touch with the sun's vital and D- vitamin-producing UVB rays. These rays are most potent when the sun is highest in the sky, and that's in the middle of the day during the summer months. Vitamin D deficiency may actually be an underlying cause of influenza. Studies have shown that people with the lowest vitamin D levels indeed reported having significantly more colds or cases of the flu. We need fresh air and the UVB-rays from the sun to build a proper stock of vitamin-D. When we’re exposed to UVB rays, our bodies make vitamin D3 sulfate. This is a water-soluble form of vitamin D3. The vitamin D3 available in supplement form is un-sulfated, and not water-soluble and it relies on LDL (the so-called “bad” cholesterol) to carry it to receptors in the body, whereas sulfated vitamin D needs no carrier. Un-sulfated vitamin D may not provide the same benefits because of its lack in mobility and perhaps availability in the body. So go outside and expose your skin to the sun, especially in the summer at midday when the Vitamin D providing UVB rays are most potent. Our bodies are designed to get vitamin D from the sun. Before vitamin-fortified foods and vitamin D supplements, the sun was the only real way for the human body to form vitamin D.
But if you're not spending time in the sun, do consider taking a Vitamin D supplement, but always check with your doctor before starting any new supplement though. Your pituitary gland does amazing things when you are in meditation. It releases your body’s happy hormones oxytocin, dopamine, serotonin, endorphins, relaxants plus more. Everything good that your body can make is released when you silence your mind. Your cortisol levels diminish, which means you’re no longer in survival, stress and fight and flight mode. Moreover. Your Immunoglobulin A (IgA) increases - IgA is your primary defense against bacteria and viruses - it’s greater than any flu shot. And while you’re in meditation, you can also use your minds imagination powers through visualization to activate a powerful healing response. When you nod off, it seems like your body powers down for the night. But as you sleep, your body repairs and restores itself. When you get 7 to 8 hours of quality sleep every night, it gives your body the time it needs to take care of you, including making more white blood cells that attack viruses and bacteria. Another part of sleep/flu equation is tied to its effect on fevers that are often part of the illness. When you feel flush and hot, that’s a sign your body is hard at work, engaged in a battle against the flu virus. Fevers tend to rise at night when you’re sleeping (and coincidently when your body is in full repair mode).